This is a continuation of my food making story. I started weaning Tiny A about a month and a half ago now, as well as documenting my experience with baby food making. 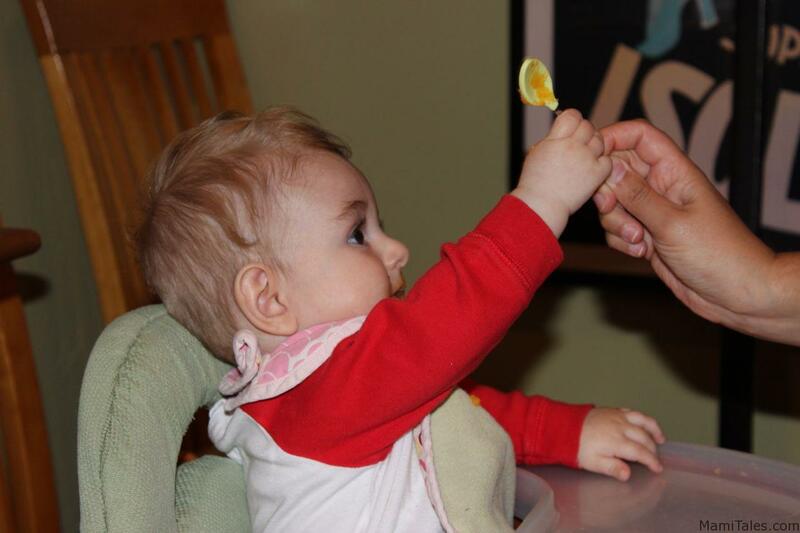 First we tried bananas, rice cereal, apple sauce, pear puree… he was having misgivings on having a solid diet. He would have 2 or 3 tastes, then make faces or just plunge his chin into his chest and seal his lips tight — no food shall pass! I was frankly getting concerned. He didn’t seem to like solid food or other flavors very much at all. However, persistence has never been a problem with me, and I really wanted my baby to life food. And then we kept on trying different flavors, different textures, etc. The first thing I noticed about Tiny A was the fact that he didn’t want to be fed. He wanted to handle the spoon and dictate the speed on which he was being fed. So I got a longer handle soft-tipped spoon and let him “help” ME feed HIM. I also realized he was beginning to react favorably to apple sauce and rice cereal, so I tried to give him more of that. And instead of defrosting two ice cubes of food, I started defrosting only one. I also got him finger foods from the store; little rice, oat and whole grains finger food snacks: sweet potato, sweet potato with mango, apple and apple with spinach. Having him being able to pick up his own food and taking it to his mouth did make a big difference. After that, he was more receptive to try different foods — even if it was me handling the spoon! Then we found avocado. I mashed fresh avocado with a fork and fed him the mush. He LOVED it. He would smack his lips, then open his mouth for more. After much trying and testing, he’s come around now and now really enjoys sitting down and eating with us. I start with giving him a little bit of whatever mush I’ve prepared for him, and after a few spoons of it I give him a little bit of finger foods. Then keep mixing and combining the mush with his finger foods. I still haven’t tried egg, nor any proteins yet. That would be our next step! Once we do that, I’ll report back with the results. Tagged Baby food making, weaning to solids. He’s a lucky baby boy to have such an attentive mommy! I do love him with all my heart, and I’d do anything to make sure he grows the best possible way… but I have to say that doing my own baby food has been considerably easier than I ever expected. It can be tricky but, of course, persistence is key. Baby always knows what they prefer and is easier for them.